Have you ever walked out of a car dealership because they didn’t have a car in the right color or struggled to choose a stand mixer in the perfect accent color for your kitchen? You probably have, so it shouldn’t surprise you to learn that colors have a huge influence on purchase decisions. 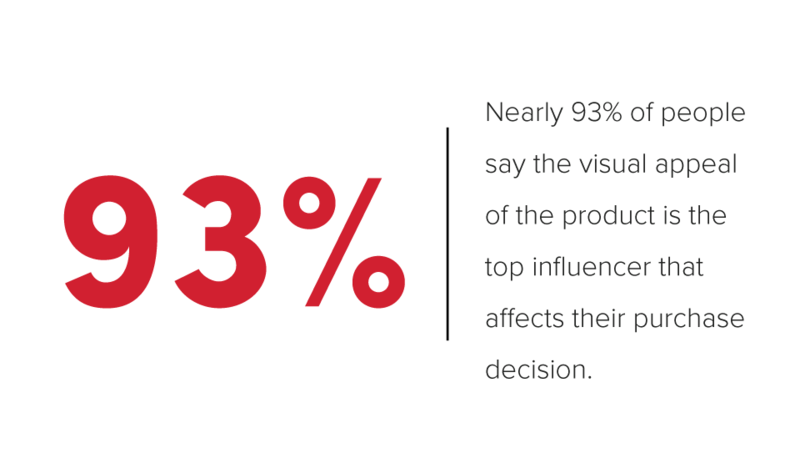 In fact, nearly 93% of people say the visual appeal of a product is the top influencer that affects their purchase decision. That's why so many businesses use color theory for marketing purposes. Does color theory really matter to your business's marketing strategy? Color can have a huge impact on purchase decisions. Specific colors can make a memorable first impression, help direct your audience's eyes to your call-to-action and turn that impression into a conversion. Think about the last time you were shopping online; the checkout button was easy to find, wasn’t it? It was probably a green or yellow/orange color, and it probably stood out from the rest of the page. What about social media and banking websites? Odds are your favorites use a decent amount of blue. These choices are no accident. They’re meant to grab your attention and get you to stay longer (and hopefully spend money). In addition to helping with conversions, colors can also be used in digital marketing to evoke emotions and levels of quality with your brand. At this point, you’re probably wondering which colors you should use. I always suggest that you start with your logo. You already have a brand that likely includes a color that would be great for an action item. As mentioned above, green, yellow, and orange are common colors used for action items on websites. Don’t worry if your logo doesn’t contain any of these colors. You can use this handy tool to help pick the one that best matches the colors you already use for your logo. Although there is a lot of data to support the effectiveness of several colors, there is no one-color-fits-all approach, as every audience is different. It is important to experiment with colors and see which one your audience responds to. Using a tool like Google Analytics will help you figure out which colors work for your business's marketing strategy. Here’s how to test the effectiveness of color theory. For one month, try making your main call-to-action button green and see if it increases the clicks from the previous month. Maybe green does increase actions, but what if yellow does an even better job? Continue testing button colors to see which color works best. Once you have decided on the button color, you should also look at the surrounding colors. You want the button to stand out from the rest of the page, which makes white or a neutral color a great idea for the surrounding area. This will help isolate and draw attention to the button. Remember not to go overboard, though. Colors are important to your strategy, but don’t get crazy. We have all seen a website that’s either impossible to read or an assault on your eyes because of the color combinations used. If you are feeling overwhelmed, try this. Use white or a light gray as your main/background color. Pick a color from your logo as the accent color for menu bars and section dividers. Choose a second color from your logo (or the color palette tool above) as your action item color, keeping in mind the way those colors will make your audience feel. Keep it simple, and keep testing your website, call-to-action and button colors until you find the right mix of colors for your business’s marketing strategy.